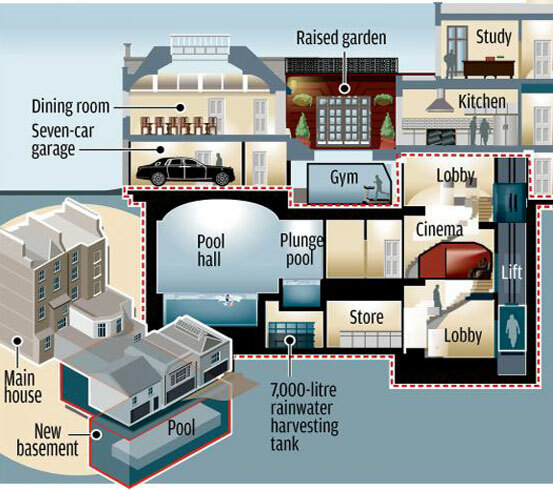 https://­www.­twistfix.­co.­uk/­basement-water­pro­ofing-productsOver the past ten years, an ever-growing number of property owners in London have chosen to develop their property downwards, creating underground developments and basement conversions to bypass above-ground building regulations. Some councils in the area have limited the permissible scale of such developments, prompting a rush of applications. Westminster and Kensington & Chelsea councils were the first to introduce the new rules, which forbid excavations deeper than a single storey (apart from in ’exceptional’ circum­stances) and allow for excavations covering only up to 50% of the garden. Other councils quickly followed suit and more are expected to. Before the new rules came into force, a sudden rush of applications included several from the city’s rich and famous, including Roman Abramovich (owner of Chelsea Football Club), Tamara Ecclestone (Formula 1 heiress) and Lakshmi Mittal (steel tycoon). Hans Rausing, heir to the massive Tetra Pak fortune, was granted approval to build a cinema, pool and even a dedicated cigar room under his mansion in London. A spokeswoman for the Basement Waterproofing Association, Collette O'Connor, said: “There really has been an astronomical rise in the number of basement developments, many of which were not monitored properly and introducing some rules is a step forward." Charlie Bubear, the Head of the Chelsea branch of Savills Real Estate Agency, noted that excavating a basement or converting an existing one can “add significant value to a property. Basement conversions are the only way to go if you want to extend and it avoids the costs of having to move”. He also said that it would cost approximately £500 per sq. ft. to build a basement while properties in the area fetch up to £2,500 per sq.ft., with prices rising by double digits each year. After the structural aspect of excavation for conversion, one of the most important consi­dera­tions is one of waterproofing a basement and cellar and we are experts at providing materials and accessories of the very highest specification in order that our contractors can deliver the most professional and watertight solution, every time. As the ever-growing requirement for cost-effective living and working space continues, make sure that you can provide your customers with an unrivalled service, building your reputation further and increasing your leads. We invite you to browse our superior collection of basement waterproofing products. Follow us on social media to keep up to date with all the latest from Twistfix and don’t hesitate to give our specialist team a call if you need advice, information or support.